Inga Moore says that illustrating Kenneth Grahame’s famous story was both great fun and a great challenge. 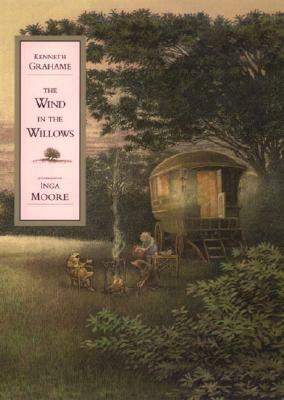 "THE WIND IN THE WILLOWS is such a wonderful book that I never tire of reading it. I couldn’t possibly let it down, so I had to do my best work ever." Of the wayward Mr. Toad, she adds, "He is a celebration of the life we would lead if only we could." [A]n elegantly designed volume ready to take its rightful place on any child’s bookshelf. Grahame’s early-20th-century classic is enhanced by lovely watercolor illustrations that provide a contemporary and packed-with-charisma accompaniment. ... Ranging from small vignettes to full-bleed double pages, the artwork embellishes almost every spread, engaging independent readers and reeling in younger listeners with entertaining antics, gentle humor, and genial affection. There's a lot of humor in [Roberts'] offbeat artwork, and he does a fine job of conveying the warmth and coziness of the worlds within the legendary riverbank and Wild Wood of the novel. ... It’s a well-designed book (not surprising, coming from Candlewick as it does), and it would lend itself well to a parent-child one-on-one reading, especially as an introduction to the famous tale.